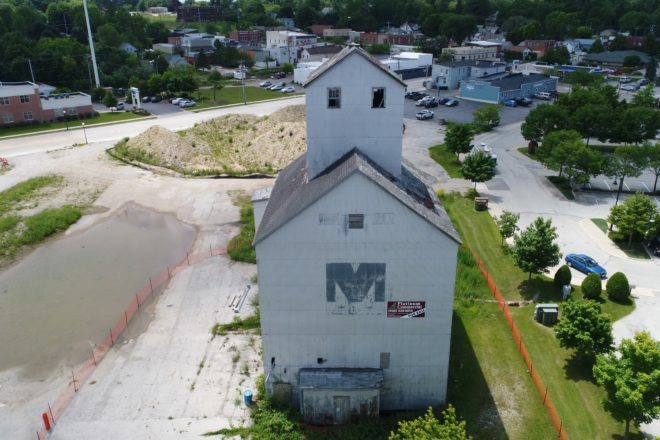 Sturgeon Bay Fire Chief Tim Dietman reiterated Friday that his order to raze the Granary was made out of concern for public safety and he was under no pressure from city officials to issue it. Dietman issued the order Oct. 17, after workers near the structure said they thought it had moved in high winds. Measurements taken by city staff indicated the structure moved 1/16th of an inch from Oct. 13 to Oct. 17. No measurements were taken that could be compared with those used in a 2013 structural analysis performed by Meyer, Borgman and Johnson for the City of Sturgeon Bay. No measurements or observations were taken from inside the structure because Dietman had declared it a risk to public safety in May. The city installed a fence around the Granary at that time. Dietman said Thursday that no further measurements have been taken since the raze order was issued. He said his order did not include the option to stabilize the structure, as is often the case with such orders, because the city has allowed it to deteriorate. Dietman said anyone who is awarded a demolition contract would be allowed on the site and in the building if they have proper insurance. After the city voted to give the Sturgeon Bay Historical Society 60 days to perform a structural analysis of the property Nov. 7, Christie Weber said the organization presented the city with proof of insurance from United States Liability Insurance Company greater than that required of demolition contractors, but the city denied them access to the grounds. City Administrator Josh VanLieshout said the insurance presented by SBHS was insufficient.